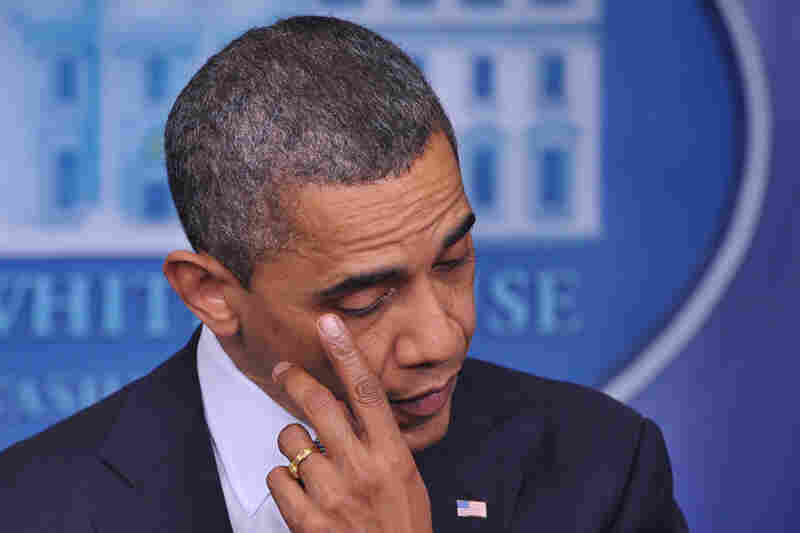 Tragedy In Connecticut: 20 Children, 6 Adults Killed At Elementary School : The Two-Way "Our hearts are broken," President Obama told the nation today as the awful news emerged. Police say they found 18 children and six adults dead at the scene. Two other children died later. The gunman's body was also found at the school. 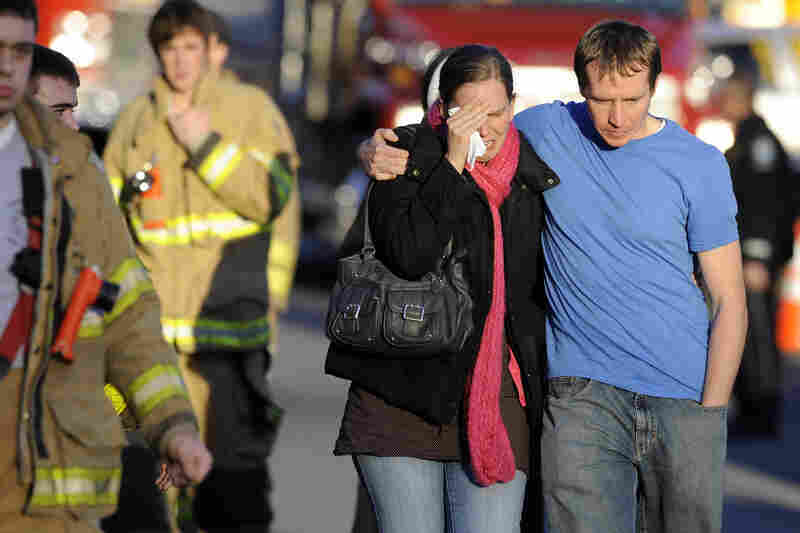 Family members leave a firehouse staging area following the shooting. President Obama speaks during a press conference at the White House. Twenty six people were fatally wounded at the school, including 20 children. The suspected gunman was also found dead at the scene. Young children wait outside the elementary school. Police patrol the streets outside the school. Connecticut State Police lead children from Sandy Hook Elementary. Family members embrace each other near the school. 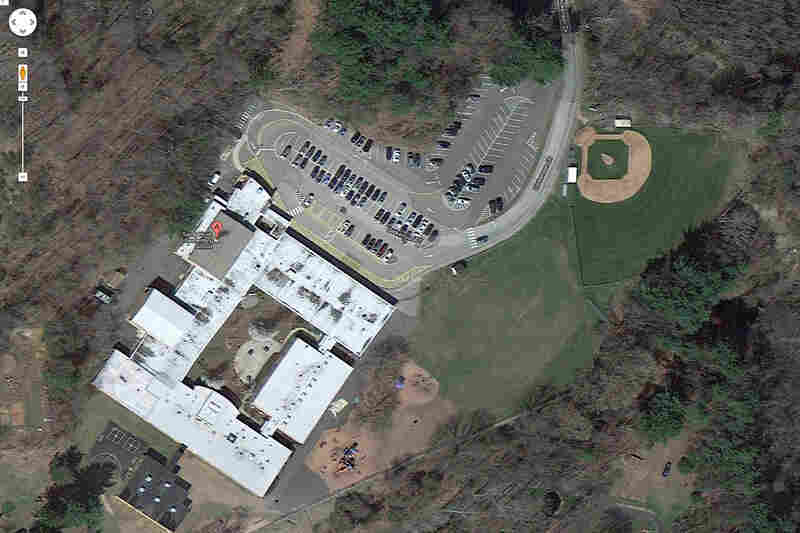 This satellite image provided by Google shows an aerial view of Sandy Hook Elementary School. At Newtown's Sandy Hook Elementary School, authorities say, a gunman identified by federal law enforcement officials as 20-year-old Adam Lanza fatally wounded 20 children — some as young as 5, according to the president — and six adults. One other person was injured. Lanza was found dead at the scene. It ranks as the worst such attack at an elementary, middle or high school in the nation's history, horribly surpassing the 13 people killed by two students at Colorado's Columbine High School in 1999. We have been monitoring and updating as this story develops. Bear in mind: During breaking news events, there's often conflicting information coming from various news outlets. We will focus on what's coming from credible outlets and sources. Update at 6:45 a.m. ET, Dec. 15. "In Connecticut: Prayers, Grief, Questions ... And Stories Of Heroism." The New York Times and The Associated Press are reporting that the body found at a home in Newtown was Nancy Lanza, the mother of the alleged shooter Adam Lanza. The Times also says that the guns used in the shootings apparently belonged to Nancy Lanza. 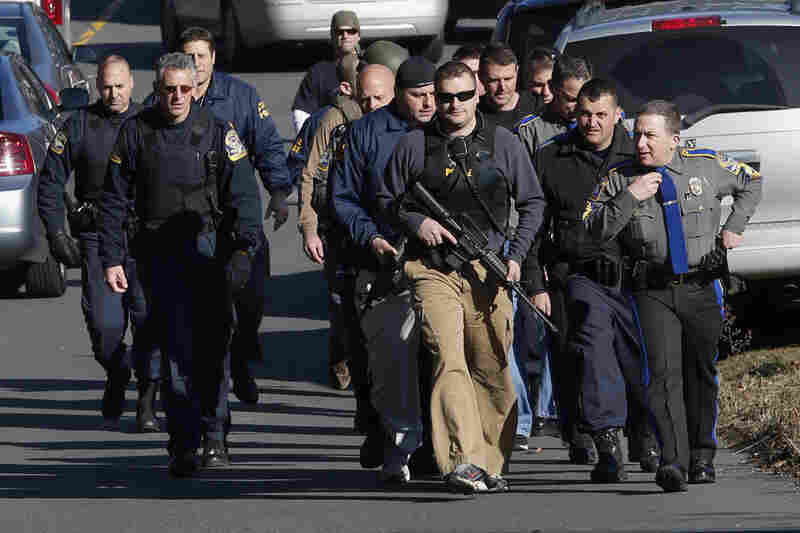 Federal law enforcement officials tell NPR that the shooter was Adam Lanza, who is said to be 20 years old. His older brother Ryan Lanza, 24, is cooperating with investigators and appears to have played no role in the shooting, those officials tell NPR's Carrie Johnson. Earlier today, sources told NPR and other news outlets that the shooter was Ryan Lanza. They have since worked to clear up the confusion. Authorities are executing search warrants at the Lanza home in Newtown. The brothers' mother, according to multiple news reports was a teacher at the school. KPCC's Air Talk spoke with Abbey Clements, a second grade teacher at the school, who describes how at first she thought the noises were chairs falling. As she realized they were gunshots, she helped students get to safety. "It just breaks my heart," she said of the children and friends who died. "And my heart breaks for those little students who had to listen to those gunshots," she said. "I couldn't stop the sound coming through." CBS News has posted a minute of audio from some of the police radio traffic as officers began to respond to the scene. 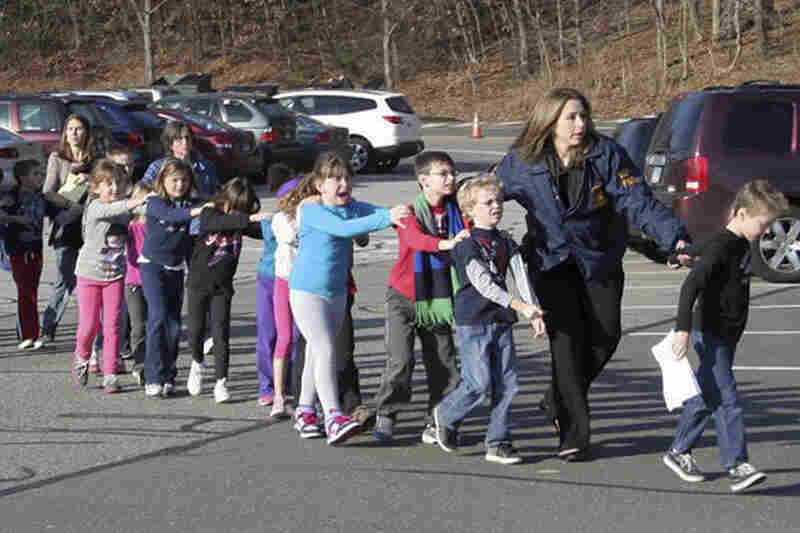 "An eight-year-old student described how a teacher saved him from bullets at his Newtown, Conn., elementary school Friday morning, where at least  people were killed by a gunman," CBS News reports. "The student told WCBS-TV's Lou Young he was on the way to the school's office when he saw bullets. 'I saw some of the bullets going down the hall that I was right next to and then a teacher pulled me into her classroom,' the student said." Update at 6:30 p.m. ET. "Evil Visited This Community." Trying to describe what happened in his state today, Gov. Dan Malloy (D) said a short time ago that "evil visited this community." But, he vowed, "we'll get through this." 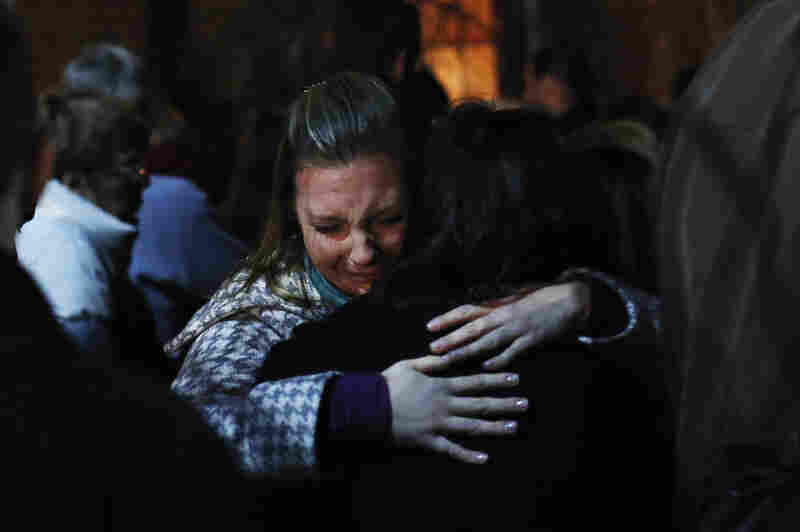 In Newtown, NPR's Joel Rose reports, people "seem numb ... they describe themselves as numb." "Parents are supposed to be planning Christmas for their children; Not a funeral." The Washington Post's Ezra Klein points to "a graphic on the deadliest mass shootings in U.S. history, a list that has changed twice since July." On July 20, a gunman killed 12 people and wounded 58 others at an Aurora, Colo., movie theater. He's "not going to confirm the identity of the shooter" at this time, though investigators do have "a tentative identification," Connecticut State Police Lt. J. Paul Vance just told reporters. He expects to give another news briefing around 6 p.m. ET. "To help deal with the events of today, there will be a memorial mass this evening at 7:00pm at St. Rose Church." "Let us come together to pray for and support the families directly affected by today's events, as well as the Newtown community at large. "There will be a mass in St. Rose of Lima Church at 7pm tonight (Friday), and the church will be open all evening for prayer." Update at 4:35 p.m. ET. Killers Blame "Everybody But Themselves." "Most mass killers have suffered some kind of chronic depression and frustration," Northeastern University professor of sociology and criminology Jack Levin tells NPR. "Over a long period of time they externalize responsibility, blaming everybody but themselves for their failings." At 2:45 p.m. ET, we posted that a law enforcement source in position to know told NPR's Carrie Johnson that the gunman's name was Ryan Lanza. 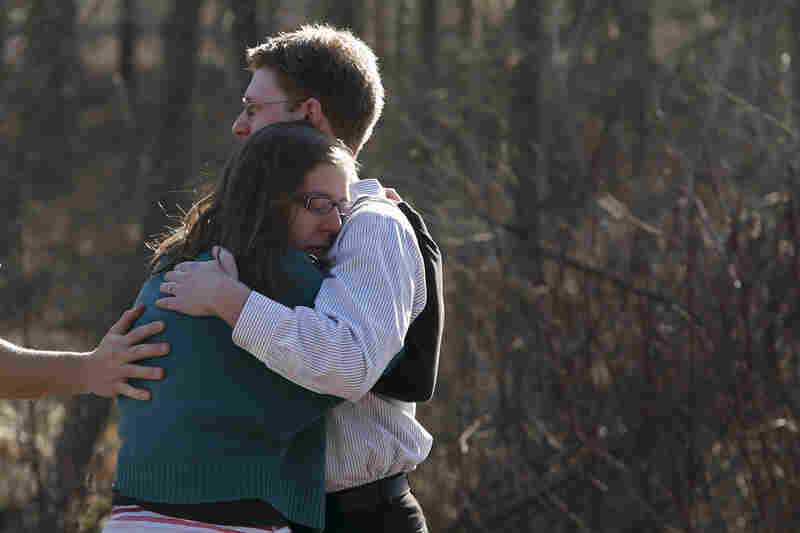 Other news outlets have been reporting that the gunman might be Adam Lanza, said to be Ryan's brother. The law enforcement source now advises NPR that news outlets should wait for Connecticut authorities to resolve the confusion. As you see, we're working to clear things up. In the interest of not repeating misinformation, we've removed the 2:45 p.m. ET update so that someone coming to this post won't be confused. As we also reported earlier, law enforcement sources say one of the weapons found at the scene was a .223-caliber rifle. Eighteen children were pronounced dead at the school and two more died after being taken to a hospital, Connecticut State Police Lt. J. Paul Vance just told reporters. Six adult victims, he said, were dead at the scene. The gunman, whom he did not identify, was also found dead at the school. Vance also confirmed that another adult who is connected to this tragedy in some way was found dead today. A visibly upset President Obama, pausing at times to wipe his eyes, just told the nation that "our hearts are broken today." "The majority of those who died today were children — beautiful little kids between the ages of 5 and 10 years old," he said. "They had their entire lives ahead of them ... birthdays, graduations, weddings, kids of their own." Flags at the Capitol have been lowered to half-staff. "Police cars and multiple press agencies are presently swarming a location at 13th and Grand streets in Hoboken," the Hudson Reporter writes. It's been reported, as the newspaper adds, that the father of the suspect in the Connecticut rampage may have been killed in Hoboken earlier today. Update at 2:30 p.m. ET. From The New York Times: Gunman's Mother Was A Teacher At The School. "Law enforcement official says gunman at Ct. school killed mother, who was teacher, then killed 18 children in class," tweets Times Deputy Metro Editor Clifford Levy. NBC News is reporting that a body found in New Jersey is that of the suspect's father. Neither of those reports has been independently confirmed by NPR. Update at 2:25 p.m. ET. "We Were Told To Hold Each Others' Hands And Close Our Eyes," Child Says About Evacuation. A heartbreaking account from one of the young students. As they were being led from the building, the children were told to old each others' hands and "close our eyes." "There were several fatalities at the scene, both students and staff," Connecticut State Police Lt. J. Paul Vance just told reporters. He said he would not give specifics, pending notification of the victims' families. According to Vance, 911 calls started coming into Newtown police around 9:30 a.m. The local police contacted state authorities, who responded to the scene. Officers "immediately entered the school," Vance said, and started both searching for the shooter and evacuating the students and staff. The gunman, Vance said, was found "deceased inside the building." John Murphy, a spokesman at Danbury Hospital, just told reporters that there are three patients at the hospital with injuries suffered during the incident. He also said it's his understanding that police will be briefing at 1 p.m. ET.